After a flurry of deals and one blockbuster trade, the dust is still settling from an eventful first night of NBA free agency. Here are the highlights from the first wave of deals. In one of the most shocking trades in recent history, the Thunder come out of nowhere to snag Paul George. It appears that OKC is doing all it can to get Westbrook to agree to a five-year contract extension. Looking at the sequence of events: OKC traded the last year of Serge Ibaka’s deal to the Orlando Magic for Oladipo and Sabonis, who they then flipped for George. They turned a Serge Ibaka rental into a Paul George rental. Even if OKC risks George walking next summer, the downside risk of this deal is not very steep. Thanks for the tweets reporting the “theft” of Paul George by @okcthunder. Harder to imagine is Indiana’s rationale for the deal when there were reportedly better offers on the table. One of these offers was from the Boston Celtics for three first-round picks, Jae Crowder, and another unnamed player. Although that Boston package contains more assets, neither of Boston’s valuable Brooklyn or Lakers picks were reportedly on the table. Perhaps Indiana felt better about building around Oladipo and Sabonis than a bunch of late first round picks. We may never find out, but we do know that the Western Conference just became even stronger. Patty is back! And at a good number too. 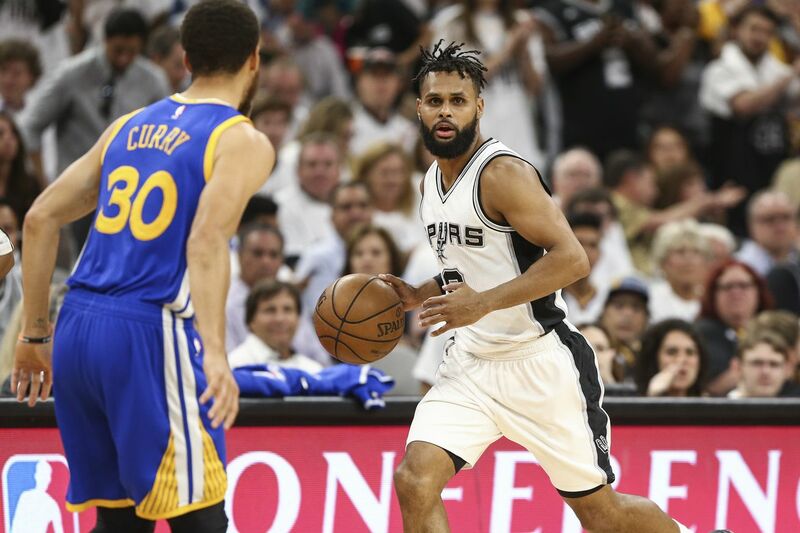 The Aussie point guard will continue giving the Spurs some much-needed depth at the point guard position. The NBA point guard market is heating up, with Jeff Teague and Jrue Holiday signing to high numbers in the first 24 hours. Throw in Steph Curry’s record-setting 5-year, $201 Million deal, and there’s a lot of money being thrown around at point guards. Now, Kyle Lowry, George Hill, Derrick Rose, and Rajon Rondo are the best point guards left on the market. If George Hill to San Antonio is still in the cards, San Antonio may have to start clearing some cap space. As covered here, initial discussions with George Hill did not prove fruitful. Apparently the Knicks and the Nuggets have shown interest in Hill, so we’ll have to wait to see how the situation plays out. As for Iguodala, the Spurs met with him the moment free agency began. Iguodala is also scheduled to meet with the Houston Rockets sometime this week. Although Iggy would be a great addition to the Spurs, rumor is that Iguodala is meeting with other contending teams to create a market for himself and put pressure on the Warriors. According to Zach Lowe’s podcast, it was Iguodala who called the Spurs, not the other way around. Still, forcing the Warriors to re-sign Iguodala for more money than they would like would itself be a small victory San Antonio. Looking forward, the Spurs still have plenty of work to do. They need to figure out new deals for Jonathon Simmons and Pau Gasol, find out if Manu is coming back, and hopefully sign a new point guard. PATFO have been relatively silent so far, but that may change soon.